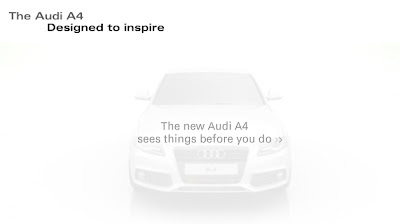 Audi A4 – Can you unmask it? I’ve only driven by the 48 sheet for this ad twice and they were in two different locations, so I’m not too sure if the type is just very light or if it somehow gets darker. I haven’t been able to find anything on it. Update: I’m convinced they definitely do. I drove past the first one I saw today and the text was very visible, and as if they were doing it just for me, on a side wall just near it, was a brand new one, just put up, and basically blank. The one I saw in a near by town was in between, so I’m not just a paranoid weirdo. Nice use of colour changing materials on a billboard. Even without explanation, pretty much new that it meant that the car had sensors of some sort. I know, one shouldn’t assume… However, it does make me wonder how many people don’t understand it. This makes me sad for humanity. okay. Too much? « A nice day for a treehouse wedding…	» It's Sunday!